Once you’ve created some great content, getting links to your site is the next step of SEO and improving your rank. Understanding the importance of links is critical to your web strategy for several reasons. ￼￼Links help search engines find your site, increasing your chances of being indexed. The data that search engines gather and store while indexing your site determines the final search results. Many inbound links pointing to your site implies a sense of popularity, which increases your PageRank. Keywords in the link text help search engines figure out what your site is about and how pages are related to each other. Links direct actual people, not just search engines, to your site. An inbound link is a link that points to your site. An external inbound link is a link from someone else’s site to your own. Although internal inbound links can be helpful for SEO, external inbound links are weighted much more heavily. Think of each inbound, external link as a vote for your website. The more links pointing to your site, the higher ranking and authority it will have. However, not all links are equal and there are several factors that determine their value. Inbound links from high ranking pages are valued higher than links from low ranking pages. High ranking pages are anything that ranks highly on Google and any particularly well-known sites like Buzzfeed, Slate, and NBC. Social media links do not count as highly for your page rank, despite the high rank of Facebook or Twitter. Inbound links from relevant, topic-specific pages are valued higher than links from broad pages. E.g. if your website is about art, then links from an art museum site will matter much more than links from a football site. Search engines rely heavily on anchor text, the clickable text displayed in a link, to determine what the page is about. Keyword optimized anchor text will help a page rank well for the targeted keywords, which is why you should just never use “click here” in your link’s anchor text. Links from trusted pages are valued higher than links from spammy pages. Links from spammy sites can actually hurt you. “Link neighborhoods” or “link farms” are pages that link to many sites and many spammy sites. These links can also hurt your PageRank. It is best to get links from more selective sites. Fresh links are valued higher than old links, which is why it is important to make link building an ongoing process. Social sharing is an important link building strategy, although many networks like Facebook and Twitter place nofollow tags on links, telling search engines not to pass credit onto the page. Links still get shared and potentially placed on sites with no nofollow tags, driving traffic to your site. Internal links, links within your site that point to different pages, are also very important since they help search engines and people navigate through a site and distribute PageRank throughout the whole site. Remember that each page on a website has a different PageRank. Internal navigation links located on the top of your site, in the sidebar, and in the footer help determine a hierarchy of pages and organization. Internal contextual links located in the body text of posts help to cross-reference content with appropriate anchor text. 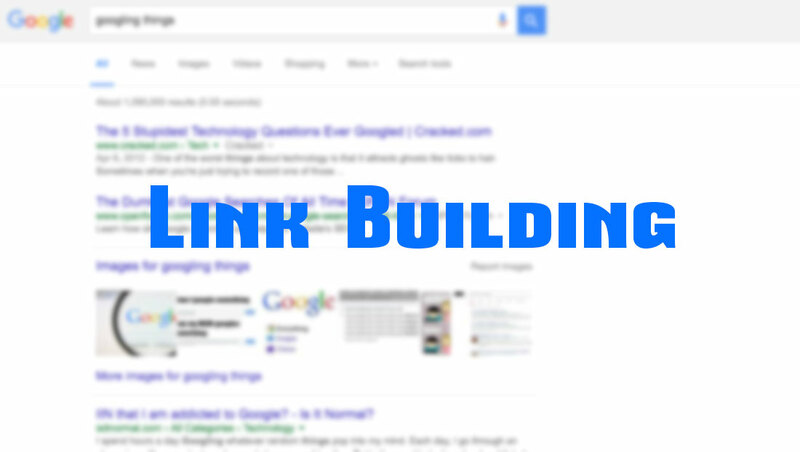 If you have a website, you should make link building a priority. Secure as many high-quality inbound links as possible. Add links to your sites from your other sites or blogs. Link from your social media accounts (profiles, posts, etc.). Add links to relevant forums, listings and directories. Tell friends, family, employees, partners, anyone you know who might be willing to give you a friendly link. Have you provided a service for another company? Get in the mindset of asking for backlinks in exchange for your service. Link analysis – the process of analyzing the links pointing to a site. There are several services that provide backlink data for your own site and for competing sites as well. Some link analysis tools include Majestic SEO, and SEO Moz’s Open Site Explorer. Performing a competitor link analysis allows you to identify sites that are linking to your competitors. These same sites are valuable opportunities for you to reach out to during the link building process. You may also decide to change your content and content marketing strategy based on your link analysis. Your competitors’ focus on a particular topic can help show a hole in your content. Editor Note: This post was published on December 4th, 2012. It was updated on August 23rd, 2016 to reflect recent changes to SEO tactics and values.